I don’t think I spend enough time in the woods. I visit often enough to know that things have changed considerably in the last 25 years. Deer and Turkey, uncommon when I first moved here, have increased in numbers to the point that they are a major factor in the future development of this woodland ecosystem. I’ve just not properly documented the changes that have occurred. The prairies have always taken priority. The prairies are where most of the rare and unusual vegetation is to be found and that’s where I’ve spent most of the free time I’ve had available for management activities. The woods has been more of an attractive backdrop to the prairies and a shady place to sit and relax during the summer. It’s just been in the last few years that I’ve found time to look more closely to the workings of this woodland. Woodland management activities have so far centered around the removal of invasive plant species. Luckily, most of the woods is free of invasives. The invasives are concentrated on the lower slopes and in the valleys. I wonder if the ridgetop soils provide an environment too hostile for colonization by invasives. These soils hold very little water and are dusty dry right down to the bedrock during late summer and early fall. I’m really curious about the effects of this dryness on soil organisms and the cycle of changes that occur over a typical year. I always have time to admire the odd shaped trees. Of course, that describes most of the trees at Blue Jay Barrens. 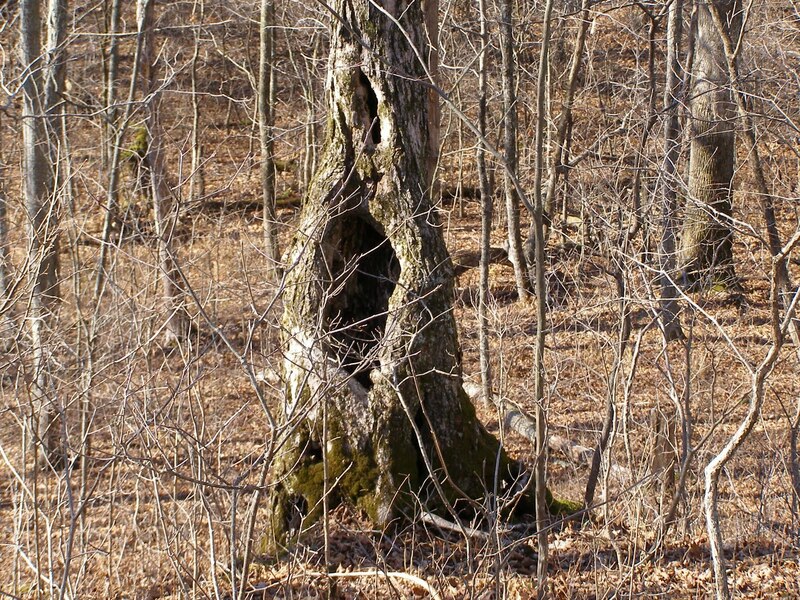 This tree has a history of being a den tree. About five years ago it sheltered a family of Gray Foxes and before that it was Raccoons. 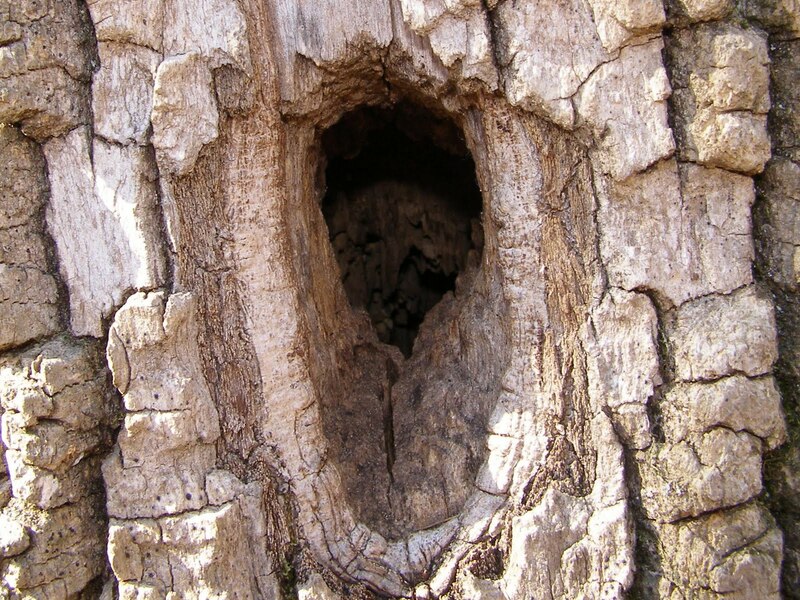 The cavity has enlarged considerably since then and is probably too spacious for these species to find comfortable. Maybe I’ll look in one day and find a bear. 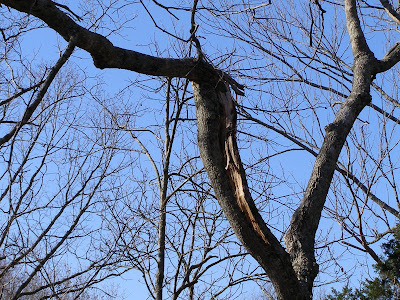 The past couple of years have been excessively windy and several trees have suffered broken tops and branches. This branch received a twist that created a split lengthwise down its center. This isn’t the type of wound that heals itself. The worst part is that the branch is still hanging up in the trees. Eventually it will die and fall. It’s things like this that keep me looking up when I walk through the woods. I’ve stopped on occasion to examine an odd looking tree in the woods, only to find that it was actually a broken branch that had fallen and speared the ground with such force that it remained solid and upright. I certainly don’t want to be in the way when a big branch decides it’s time to head for the forest floor. Even though most of the top growth in the prairies has turned brown, you still get an impression of freshness when you look out over the dry grass stalks. That image will change as winter weather works to bring the stalks down. Exposed west facing hillsides usually suffer most from winter storms and wind. This patch of grass will be one of the earliest to break down. Scattered cedars in the prairie help to buffer the grass from the wind. 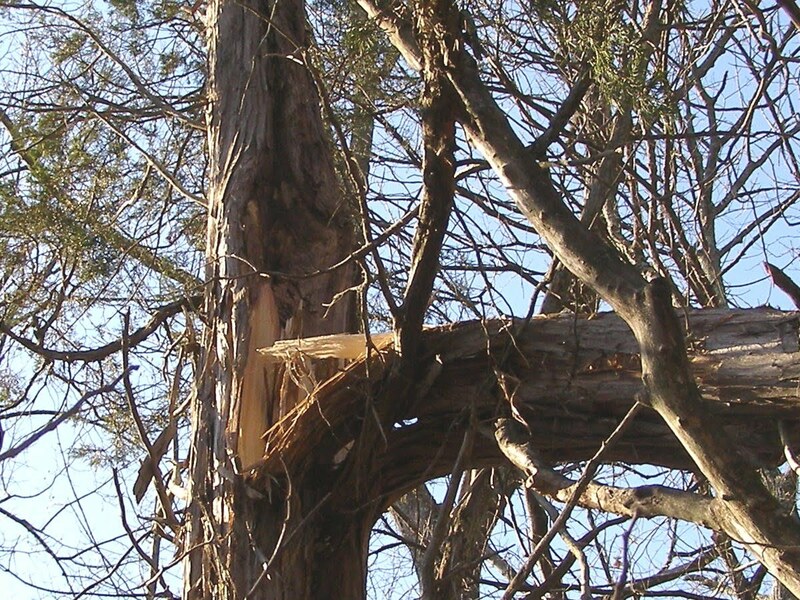 At the same time, the trees can funnel and accelerate the wind, causing increased damage in certain areas. This is an example of the canyon effect experienced in cities when moving air must crowd together and increase speed in order to pass down a city street. Randomly scattered trees are not as effective as buildings in producing the wind currents, but it’s quite noticeable when it does occur. Each species of grass exhibits a different level of resistance to the elements. At this time of year the different grasses share the same general color and are hard to distinguish at a glance. Textural differences help to distinguish patches of each species. On the right we have triple-awn grass forming a solid mass containing so many fine stems that it appears out of focus. To the left is the tough stemmed Big Bluestem. A winter dominated by wind will flatten the bluestem and leave the triple-awn relatively untouched. 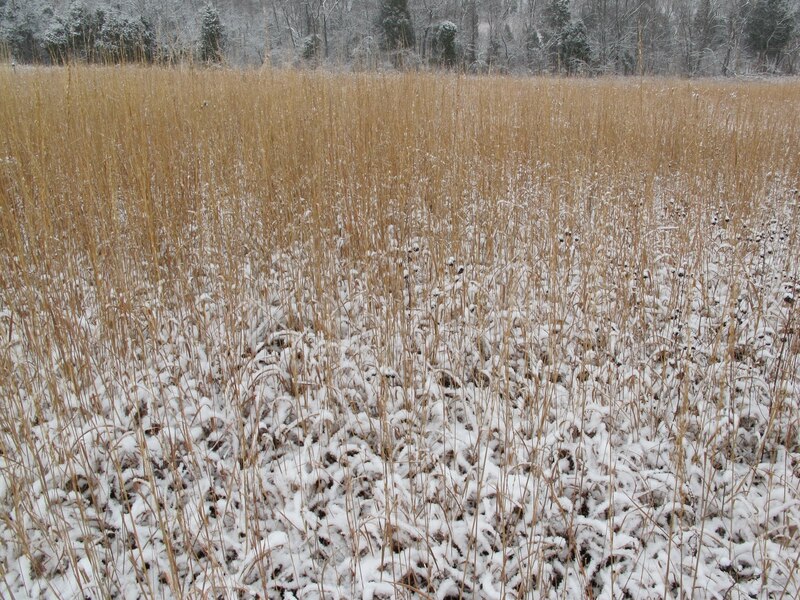 Heavy snow loads will flatten the triple-awn to the ground and leave the bluestem standing. A combination of the two weather types will flatten everything. It may appear that the fate of the dead grass stalks is of little importance to the overall health of the prairie, but locked in that dead vegetative material are the nutrients that will nourish the prairie next year. Nutrients are released from the plant material through decomposition. Decomposition occurs most rapidly when the temperatures are warm and the vegetation is moist. These conditions are most prevalent in early summer, which is the exact time that prairie plants are growing most rapidly. Plants are ready to make use of the nutrients as soon as they become available. But there’s another factor besides weather that determines the rate and timing of decomposition and that is the position of the vegetation. Material that is densely packed close to the ground will decompose earlier more rapidly than standing material. This tends to favor the early growing forbs. More upright material tends to decompose during the later part of the season and most favors the grasses. Of course, some of that material takes more than one year to completely break down and that extends and moderates the seasonal release of nutrients. 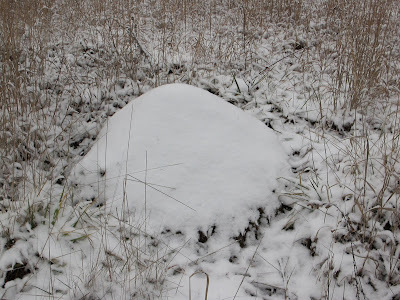 As I walk through a winter prairie, I tend to make predictions of how I think the summer prairie will look. It’s really too early to make any sound guesses, but by the end of February, I’ll have a pretty good idea of how things are going to progress. Naturally that’s assuming average weather conditions, which seems to be a rarity anymore. 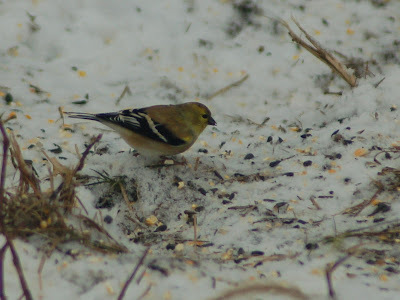 Snow, no matter how little, always increases the numbers of birds at the feeder. The Wild Turkeys have actually been making a regular stop here for months. Their appearance has more to do with the availability of food within their home range. When the woods are full of food, my yard is free of turkeys. Besides this flock of ten males, we’ve been hosting a flock of about 35 hens. I’ve been seeing the signs of a poor berry and seed year all summer. This is just another indicator. This is a more normal assemblage of feeder visitors. This morning had a group of Brown-headed Cowbirds join the crowd. Cowbirds are normally an uncommon visitor to my feeding station. A few Red-winged Blackbirds were mixed in with the cowbirds. This female was looking well fluffed. Prolonged deep snows sometimes bring in blackbirds by the hundreds. 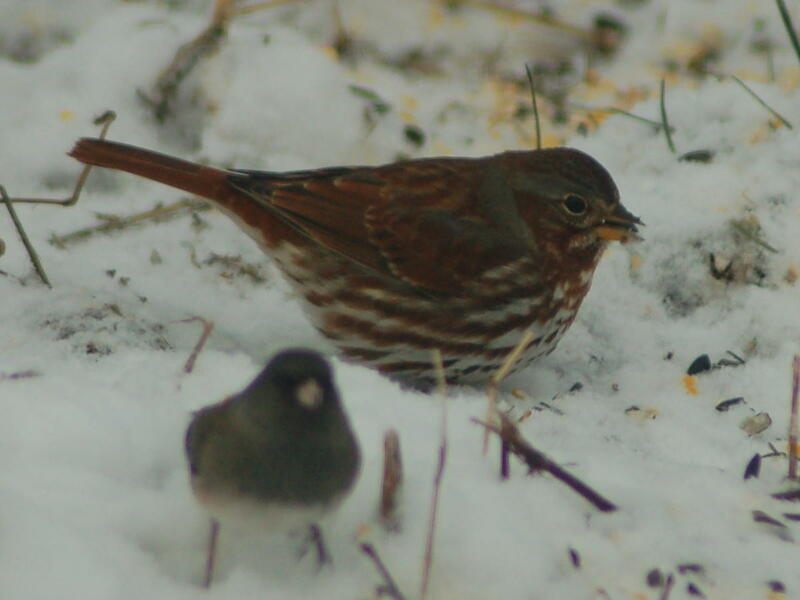 Juncos and sparrows prefer to feed in the tall grass stubble. The turkeys wear down the grass stubble in a hurry. When turkey pressure gets too heavy, I drag in a couple of branches to cover the feed. This generally keeps the turkeys away and gives the smaller birds a place to eat. Fox Sparrows are one of my favorites. These birds prefer a little bit of cover and are usually down in a hole or close to the grass clumps. They’re one of the first birds to scoot for cover if startled. Goldfinch numbers have been down all summer. I’ve only seen two at the feeder so far this season. 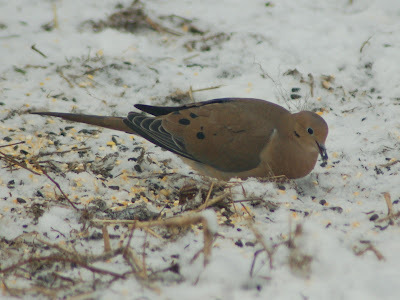 Large flocks of Mourning Doves are around every day, but they’ve been feeding beside the yard on something in the tall grass beneath the walnut trees. Very few have been coming in to get seed. 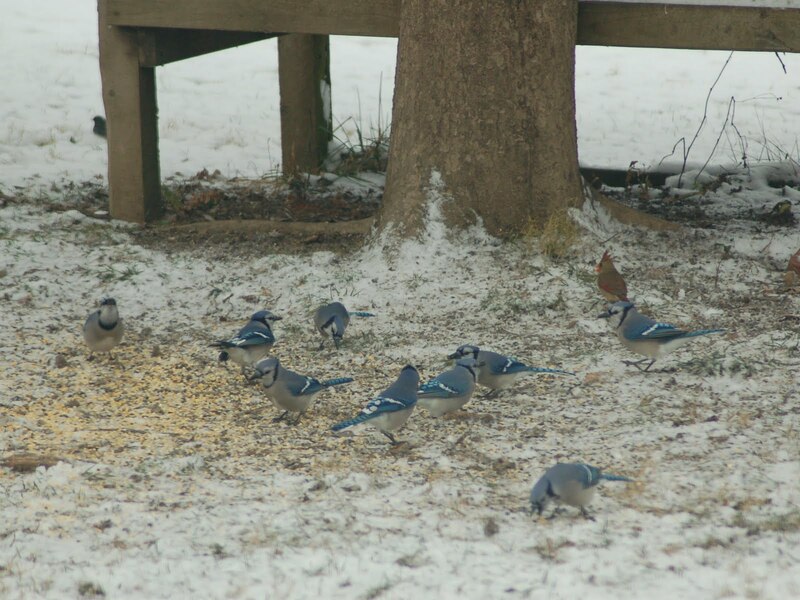 There’s no shortage of Blue Jays. They spend most of each morning hiding seeds at different places around the yard. 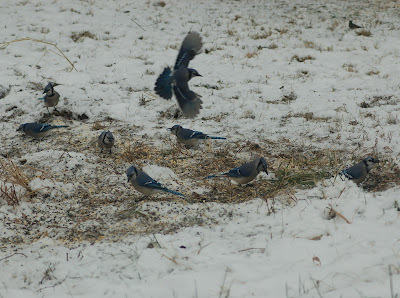 Several years ago the Blue Jay numbers plummeted. Now I think the population has finally regained its former abundance. It’s once again impossible to walk around Blue Jay Barrens without seeing Blue Jays. Or maybe it’s more accurate to say you can’t avoid being seen by Blue Jays, since their scolding at your intrusion is often the first clue that they are around. 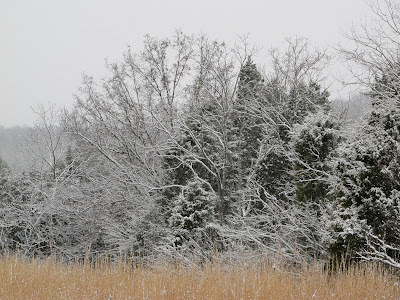 As predicted, snow arrived to change the color and texture of the landscape. Temperatures stayed at or just above freezing, so the snow was wet and stuck to whatever it touched. 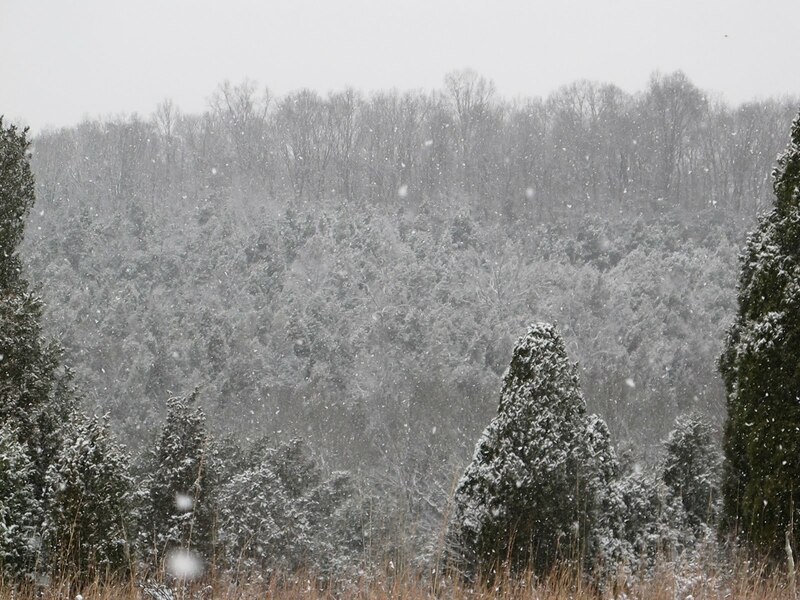 It made for quite an attractive scene, but snow, like any other type of weather, can have a wide range of effects on the plants and animals of an area. 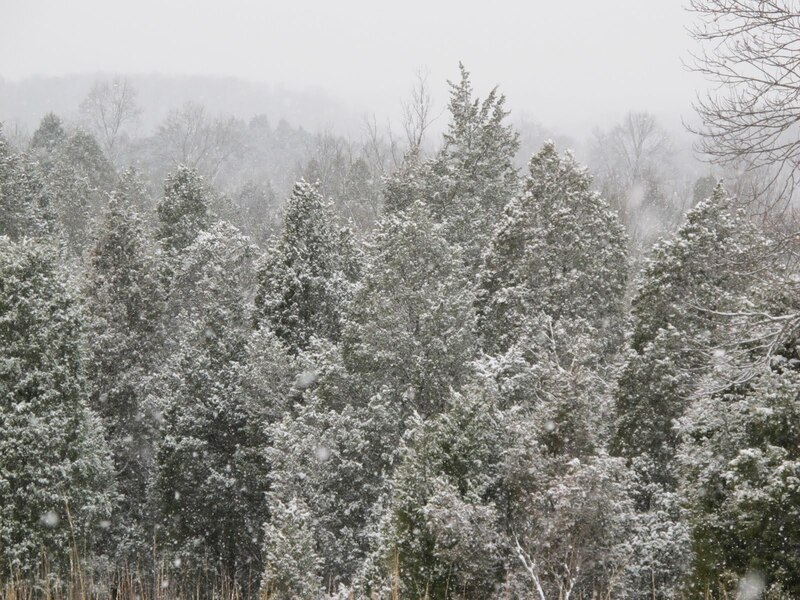 The greatest threat to Eastern Red Cedars during the winter is the loss of branches due to the weight of a heavy snow load. Wet snows sticking to the branches cause them to spread. As the branch becomes more horizontal, its ability to capture snow increases. If undamaged, the branch will return to its original position after the snow is removed. During the winter, this is often a slow process, so branches even slightly bent now could be more vulnerable in the next snow. Snow on branches makes it hard to do any clearing work. Besides being an uncomfortable experience when snow falls down your back as you try to cut the trees; the snow causes everything to be slippery, including the equipment you are trying to use. The snow adds too many dangerous possibilities to the job, so clearing work is put on hold until the snow is gone. You can’t mow with snow on the ground. The snow makes the mower and feet prone to slipping. 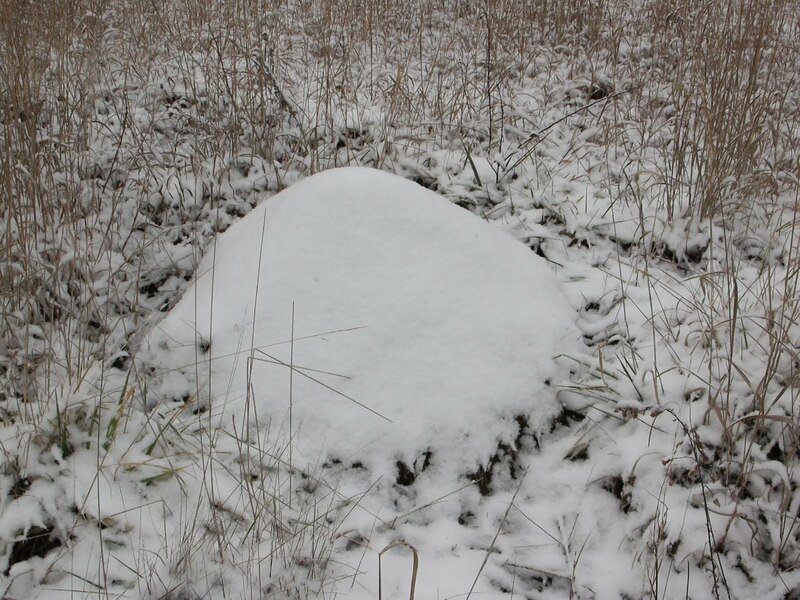 Features that you might wish to avoid with the mower, such as this ant mound, are often hidden by the snow. The spinning blade acts like a fan and cools the mower deck. This often causes moisture to freeze under the deck and disable the mower. 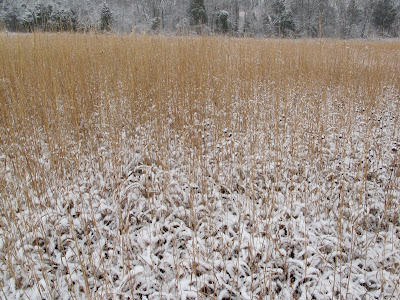 Wet snow catches on the leaves of the tall grasses and causes them to bend down along the stem. This greatly reduces the effectiveness of the grass as cover for small mammals and birds. The result could be a greater mortality from harsh weather conditions later in the season. The condition at ground level plays an important role in the survival of many insects. Most insects in this area are adapted to cold temperatures and easily survive the winter. The harshest winter conditions for the insects are periods of cool wet weather. 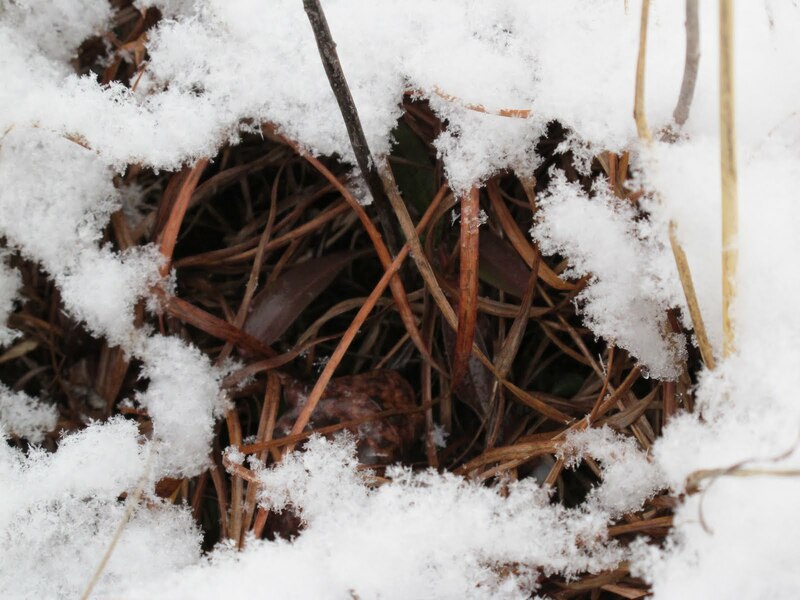 An early snow fall on warm ground can keep the ground insulated and protected from freezing long into the winter. Damp conditions allow various diseases and fungi to attack overwintering insects, and mortality can sometimes be high. Fortunately, we didn’t have a great amount of snow and predicted sunny days promise to make the snow rapidly disappear. 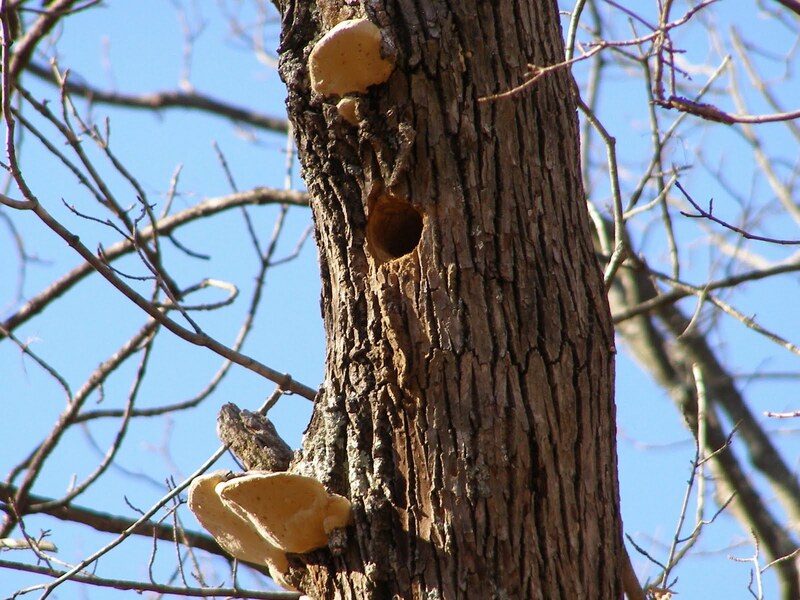 I mentioned a couple of weeks ago that trees hosting shelf fungi were attractive nest trees for woodpeckers. The white shelf fungi on this tree glowed in the sunlight like a beacon, causing me to change my course and come over to investigate. There between two growths of shelf fungi, I found a woodpecker hole. The feeding of the fungi on the deadwood of the tree makes for easy digging. A bit lower on the trunk were these oval holes that were probably made by Pileated Woodpeckers. 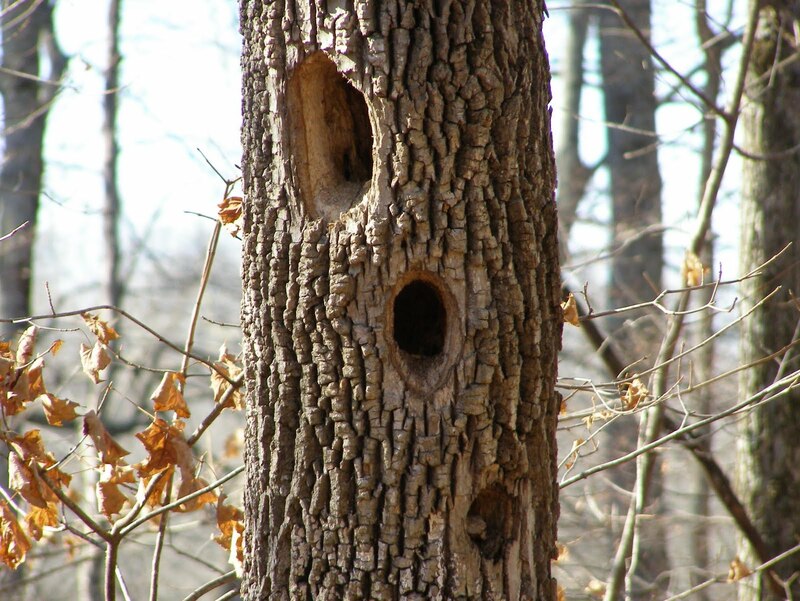 The holes were too high on the tree to determine if they were intended as nest holes or were the result of feeding activity. Pileated nest holes are typically more rounded than these, so I'm guessing this was just feeding activity. 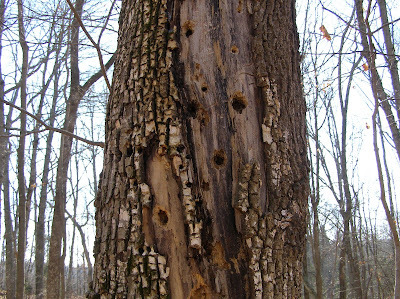 The tree is fairly large and shows signs of woodpecker activity along the entire length of the trunk. I wouldn’t be surprised to see the tree down on the ground within the next couple of years. I guess then I’ll get a closer look at the holes and be able to tell what they were used for. I’m sure a few of the holes higher on the trunk were entrances to nest cavities, but most of the activity was clearly pursuit of insects. 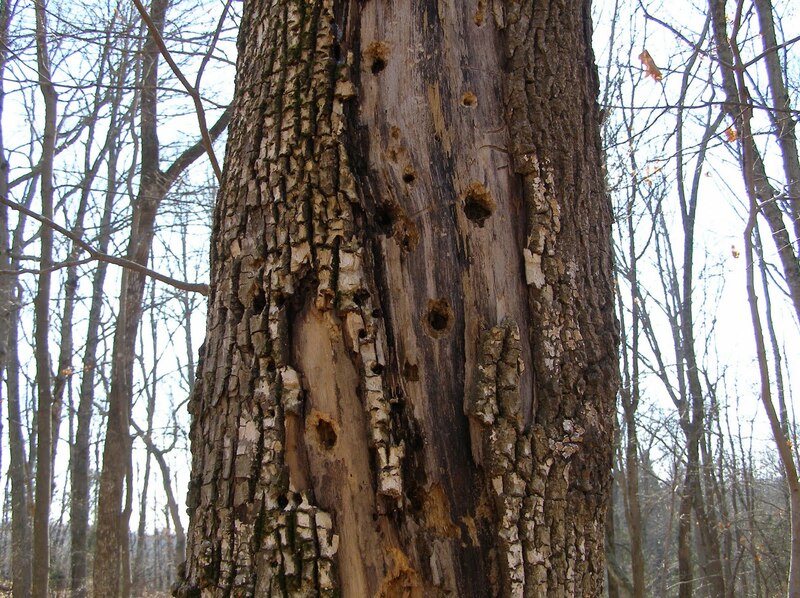 Many areas had sections of bark removed and various small sized holes in close groups. Some are older holes that show signs of new growth attempting to heal the wound. I don’t think this tree is going to be around long enough to do any real healing. 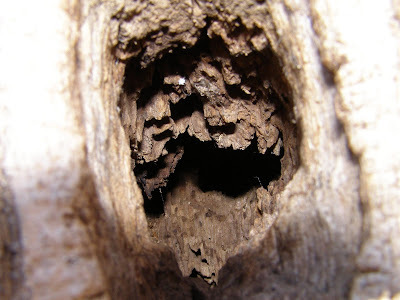 The heartwood shows signs of insect tunnels and galleries. Many animals utilize the holes in order to access the potential meals inside. 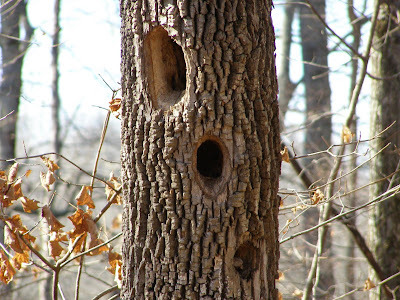 I’ve seen mice, skinks, opossums and raccoons work use woodpecker holes for access and then work their way up through the center of a tree. 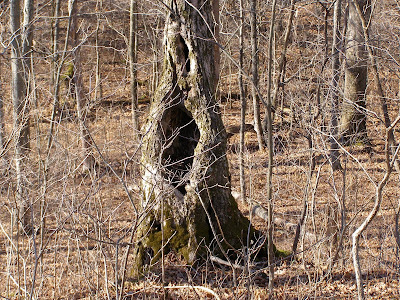 It doesn’t take long for the tree to be hollowed and left to await its fall to the forest floor. The recent rains seem to have added enough weight to bring down half of this split leader cedar. When two or more tops form in a tree, it’s not unusual for there to be a weakness at the point of divergence. Each year of growth increases the degree of instability until a simple event, like a gentle rain, causes the tree to break. 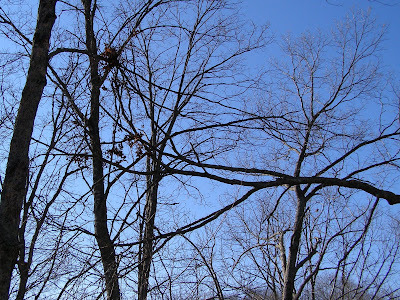 Cedars that grow in the woods have tall bare trunks, but their tops are quite dense. The top has flattened itself onto the ground and will effectively shade any wildflowers that emerge here next spring. I’ve added this to my list of things to clean up this winter. At least it fell without hanging up in any of the surrounding trees. It did manage to give itself a bow and a little twist as it wedged itself between the two trees. 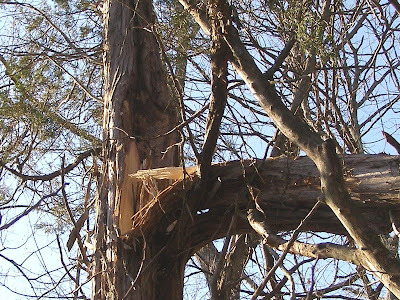 A cedar branch under tension contains a lot of stored energy and can easily mangle someone who makes a cut in the wrong place. I’ll be sure to study the potential danger points before I cut this guy. The part that fell didn’t have much support at the join. Just above the break is the area where the two branches grew too closely together to support bark. Above that point, both parts had enough room to grow full trunks. It’s surprising that this narrow slice of living wood was strong enough to support the weight of the tree for this long. The loss of one trunk has left the tree with branches on only one side. Branches will eventually grow into that void, but they will never be able to form a symmetrical top like the perfect cone displayed by the neighboring tree. The Blue Jay Barrens landscape has taken on what I think of as its winter appearance. With the exception of the evergreen species, the colors have become dominated by browns and grays. Even so, there’s still a brightness and freshness about all of the plants. The grasses and forbs are still standing upright and all display a strength that makes you believe they could stand forever. Four months of rain, snow, wind and animals will certainly change the look. In late March I’ve seen this field look as though the circus had just packed up and left. The type of winter weather we experience this year will determine the look of the field. Leaf fall and my clearing efforts now make it possible to view the series of prairie patches. Light brown for prairies and grays for the trees. Eventually, I’ll reach the point where the prairies are connected by a series of open passages. In a year of normal rainfall, all of the cedars would be bright green at this point. Varying degrees of drought stress has left them ranging in color from green to yellow to brown. Position on the landscape has greatly influenced the amount of rainfall available to the tree and the resulting color change. The brown tree near the center of the photo sits directly atop a watershed break and had the least amount of available moisture in the line. Viewing a block of cedars shows the same variation in colors among the stand. The resulting color pattern is partly due to individual tree genetics, but the microclimate at the site of each tree has had the most effect. We’ve had nearly five inches of rain during the last two weeks, so soil moisture is much improved. The water won’t do much to improve the cedar color unless the temperatures are high enough to allow for photosynthetic activity. 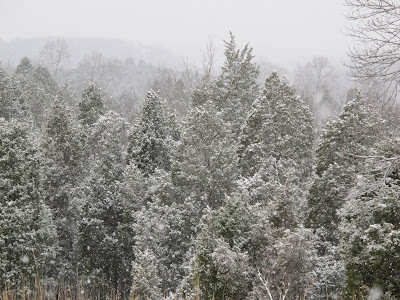 Cedars typically lose some of their green color during the winter, so the already off color trees could really look afflicted if we have an extremely cold winter. Rain and winds have stripped most of the oak leaves from the trees. 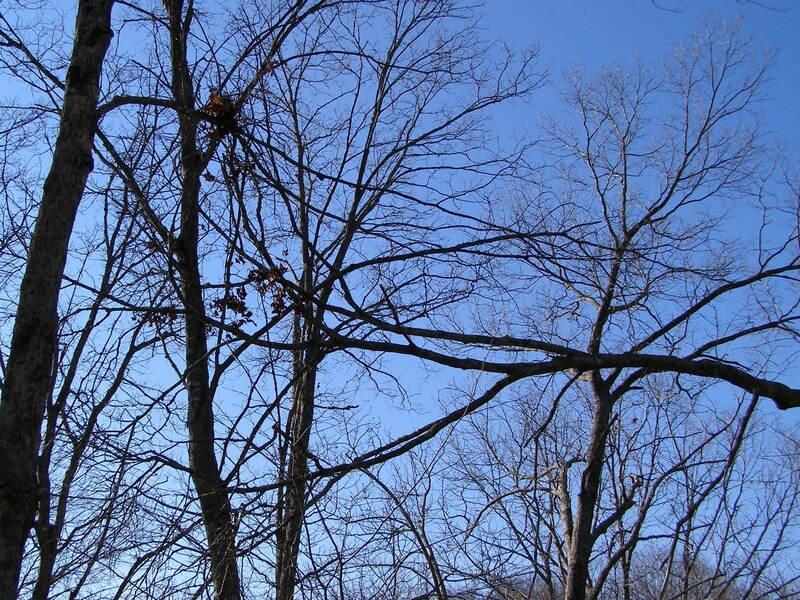 Oaks often retain their leaves long into the winter which makes the woods seem more substantial. Things just seem to be too open and exposed for early December. I just get the feeling that I’m going to be looking at the browns and grays for an awfully long time. Every December, I’m newly amazed at the beauty of the Diarrhena Grass, Diarrhena americana, growing in the woods. Cold temperatures cause the grass to take on the color of golden honey. With the addition of sunlight, the whole hillside glows. The Diarrhena Grass covers a large expanse of wooded hillside that was once extensively logged. This section was much more open 40 years ago. I’m wondering if the grass colonized the more open situation and now persists in the shade or if the grass was already here and just survived through the period of more sunlight. It’s odd to see what looks like a prairie in the woods. It might appear that some clearing would be appropriate to bring sunlight to the grass, but the near 100 percent tree canopy cover makes this a true woodland. The grass actually thrives in the shade. It might even have some physical adaptation that keeps it from being covered by falling leaves. The tree leaves seem to filter naturally through the grass stalks to form a thick layer near the ground. Seed stalks remain standing free and tall. I think Diarrhena Grass could be a valuable tool for woodland restoration. The grass grows on the steepest of areas and would provide perfect ground cover for an eroding woodland hillside. The grass would catch the falling leaves and the process of building stable hillside soil could begin. There are still many questions concerning growth patterns and behavior of Diarrhena Grass that I would like to have answered. What is the mechanism for colonizing new areas and why do existing stands not spread across the entire woods? The hillside in the foreground has a thick cover of grass that has remained unchanged for the past 25 years, while the hillside beyond is free of Diarrhena Grass. What factors cause one hill to be covered while the other remains bare? The functioning of a Diarrhena Grass ecosystem certainly deserves more study. I know that many spring wildflowers are found growing with the grass, but I haven’t done any counts to see how species numbers might differ from those in the non-grassy woodland. It seems that the added cover might be attractive to ground nesting bird species, but this is another thing I don’t know. There must be insect species that utilize all this grass. Maybe there’s even a rare species that’s Diarrhena dependent. Looks like a lot of material here for someone’s graduate thesis.